Enjoy 5 issues of Studios magazine exactly as they were printed. 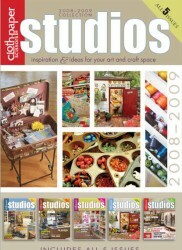 Studios 2008-2009 Collection CD features beautiful and functional spaces of the everyday artist. Get inspirational solutions for maximizing space, find ways to organize when on the go, choose the best lighting fixtures for any space, and much more. The full-color, electronic versions of the magazines enable you to explore the original and informative content that Studios is known for with easy-to-navigate tabs and printable articles. Whether you are designing your first creative space, or just want to find new inspiration and organizational tips, Studios will give you the fresh perspective you seek.